Celebrated for their courage, vision, hospitality, and spiritual giftedness, it's no wonder women were so important to God's plan revealed in the Old and New Testaments. It wasn't their natural qualities that made these women extraordinary but the power of the one true God whom they worshipped and served. 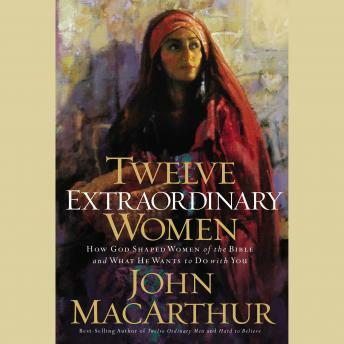 In Twelve Extraordinary Women, you'll learn more than fascinating information about these women, you'll discover-perhaps for the first time-the unmistakable chronology of God's redemptive work in history through their lives. These women were not ancillary to His plan, they were at the very heart of it. Ruth (Ruth 1-4)Anna (Luke 2:36-38)Martha and Mary, sisters of Lazarus (Luke 10:38-42)Mary Magdalene (Matthew 27:56-61)Sarah (Genesis 11-25)Hannah (1 Samuel 1-2)The Samaritan woman (John 4Mary, the mother of Jesus (Luke 1-2)You will be challenged and motivated by this poignant and personal look into the lives of some of the Bible's most faithful women. Their struggles and temptations are the same trials faced by all believers in all ages. And the God to whom they were so committed is the same God who continues to mold and use ordinary people today.